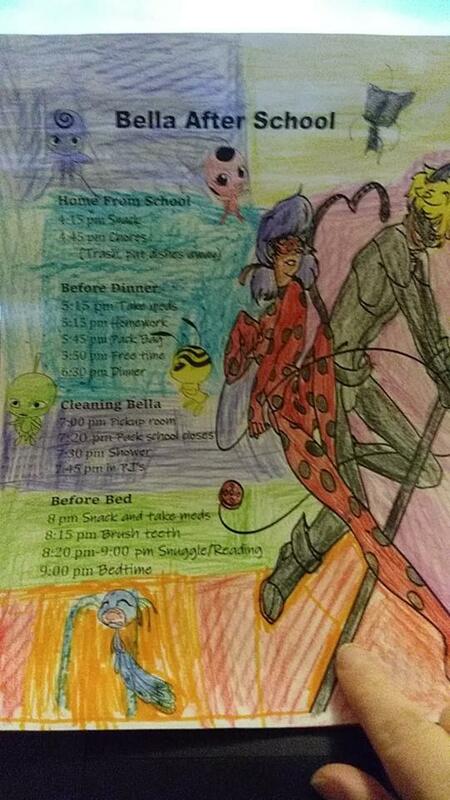 Some of you have asked what is a typical week night routine in our home looks like. Structure and routines help typical children thrive but when your child has adhd both physical and emotional adhd it helps to have consistent routines. Here is a copy of our routines chart. Mind you Bella is 11 but still needs routine changes set her world off in a huge way so we created a chart a while back using a ticket time reward system for positives reinforcement. A bucket filled with goodies for her to keep on with organizational skills and time managements skills. Creating a reward at the end of the week helps with intrinsic values. Adhd both physical and emotional its not only about pills but skills to that help. Medication is only half of the battle. I will not list her meds here as I don't want a bunch of people going out getting meds their children might not need. However they have helped and even teachers notice a difference with Bella on meds vs without meds. The chart helps make Bella more in control of her actions and helps remind her with out my having to prompt her every 5 minutes. I will share this up on the blog too. For more check out our website filled with tips and tricks we have used from my first hand personal experience living with 22q11.2 deletion syndrome. I hope this has helped as some of you have asked to see a routine chart that we use.